Rev. Dr. Chris Oyakhilome (D.Sc., D.D. 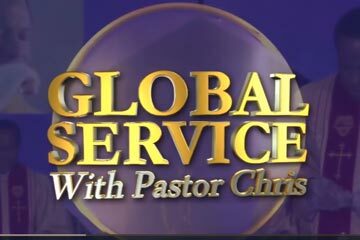 ), runs a massive global prayer network, which has garnered over 40 million followers spread across all of the seven continents of the world. The number of followers keeps expanding by the minute as many connect to the man of God’s prayer network, hosted on the KingsChat platform which is available on the web and on mobile applications and also through various social media platforms including the Loveworld News and Kingschat app. Through the rich and inspiring global prayer network, followers of the man of God, at specific times of the day are guided in succinct prayer points, to pray with Pastor Chris. Regularly, as led by the Spirit of God, the man of God, Rev. Dr Chris Oyakhilome, instructs his followers to pray, as led by the Spirit of God, on specific issues.The prayer posts have covered a number of issues and consistently each time, the man of God gives specific pointers to issues of life and ministry as the Spirit of God would have the people give attention to. We are children of the Abrahamic covenant. Learn what this means, in today’s Rhapsody. Visit http://rhapsodyofrealities.org for information on Rhapsody missions around the world. 1 John 4:17 says, ’Herein is our love made perfect, that we may have boldness in the day of judgment: because as he is, so are we in this world’. At 12noon and 10pm (Local/GMT), we’ll pray in tongues of the Spirit for most of 15min, declaring our oneness and perfection in Christ. We are complete in Him and His Word in our mouths is God talking. Glory to God! Remember to attend the midweek service today in church onsite or online. God bless you. Thank You Beloved Pastor Chris. I will surely allow The Holy Spirit to guide, instruct and inspire me deeply in prayers. Oh glory to God,for His mercy endureth forever. Psalm 91:16(NIV) With longlife will I satisfy him and show him my salvation. Thank you Pastor Chris for spreading the gospel to the world you have changed millions of people over the world with your teachings including me. I love so dearly my father. I love you Pastor God bless you Sir. Thank you Pastor, for such a time like this to fast and pray with you, what a glorious experience. I love you Sir. Thank you Pastor Sir for divine word to pray about today,Love you Sir Pastor. Thank you pastor sir .God Bless you. Thank you Sir, I love you forever! Pastor thank you, for have learned a lot from you, am the heal of God, last year i was diagnose breast cancer ,i refuse treatment and i took charge over the situation by cleaning my body, i starts juicing and living on Raw food, i attend The healing school in South Africa, and for one year, there is no sign of cancer growth cells in my body glory to God, but i have to go in for operation to remove the mother cancer. I need prayer. Praise God.Am really blessed by your teachings and pray that am imparted by you to manifest Gods wisdom in all dimensions.Am a teacher by profession and would request prayer against a surge in blood pressure experienced from December 2017.My kids clinton age 10,glory age 5 and terry 10 months have had chest attacks.I have stagnated as a deputy principal for 10 yrs, i completed msc (chem) course work in 2013 but i am yet to write my thesis; i saw my two brothers unable to complete the first degree.I would want to own my own residential house and clear all debts accrued. Pastor Chris I keep having bad dreams about my family please help me pray in Jesus name, Amen. Pls pray 4 my mum who is in comma. I also want to find out when d healing school will reach Nigeria. Thank you. Good day Sir, declare expansion and growth to my transport business. Thank you. i love 2 hear pastor chris message always, an i no d hear English well well, pray 4 me dat i should learning English an spirit of knowledge of d Bible an wisdom thanks. Please pray for that who dislikes me, God will touch them and also change their life, from hatrate into love, I need you to pray for rossy, johnny, sunny, shamoon, nasir, tariq, ishtiaq, zafar uncle, vincia and many more. God to intervene in my job situation. The investigation against me. The holy spirit to intervene and brush every accusation aside. That Sabria shd be shamed for accusing me.. Please pray for complete healing from high blood pressure. Can you please pray for me i have cancer my name is Valerie McClarty. It has already blinded me in one eye please pray. Pls pray for every member of my family. Many are not saved. Pray for deliverance and salvation. God bless You! I am really happy to here the word of God ..specially from Pastor Chris. touching my heart.I want to be a power full girl from the spiritually. Please pray for my business from loss to success in the of Jesus Christ. Thank you so much, Mr.Pau. I have been suffering from depression for 7 years. I am 23 years old. My dad has diabetes and I feel bad when he injects insulin into his stomach. My mom has blood pressure which is inherited. My sister used to love studies but now she has no interest in them again. please pray for my family. please pray for me and my family for breakthrough.we have suffered for long. pastor i m from pakistan plz pray for my husband income and for his cases. Dear Pastor Chris Oyakhilome, I am a Christian. I pay my tithe, I give offering. I sow seed. I vow and redeem my vow. However, a taxi driver stole my goods that I sell. Even when he (the taxi drive) admitted of being responsible for the theft. The police connived with the taxi driver, because, they know the owner of the car, which is used as taxi. Why? The matter is now in court. Therefore, I need victory, favour and success to recover my stolen goods. Please pray for me. Thank you. Dear Pastor Chris : I am really very glad that I have found you online. I thank God really. I am learning and being blessed. May I ask you to also pray for my son to get employed please. Hoping to hear back from you. Elizabeth T.
Dear Pastor, From last four years I m Going through in a very difficult time. No peace, joy, in my heart and at my home. I m very much irritated, frustrated , depressed with the situation I m going . From last 15 years I m going thorough in debt but till today I m not debt free. I m found unnecessary fighting in our home. My collogues and neobours are very much against us creating problems to irritate me and my family. Every thin we do is not going smoothly. everything we do goes wrong. No peace at all to me and my family. I m also very much struggle to get a job. I need a Job. There is no financial stability only salaries are coming and going . no blessings at all to the income. I don’t know what is happening to my family . today I repent to the Lord. Pl prayer me and for my family for the blessings of the Lord, Peace , Joy of the Lord . Please pray for my mother Mae Blount who is fighting for her life. She is 80 and had a brain tumor removed. She is at Johns Hopkins Hospital in Baltimore, Maryland. She needs a miracle. Pray also for healing for Juanita Randal and my sister Melissa who are here in Baltimore. I too need healing for my mouth. My birthday is Tuesday, Oct. 10 and I need a financial miracle. I would like to be able to go out and celebrate. Are shaking and making sounds manifestations of the indwelling Holy Spirit? The leaders in Nigeria by the power of the Holy Ghost function in wisdom and enact laws and policies that are favourable to the Church! The Church is matching on! Thank you Pastor Chris....my flourishing has started....its happening so fast..praise be to God. Thank you Pastor Sir. I am flourishing in The name of Jesus. Thank you very much Pastor for the wonderful teachings, healing and prophecies. Thank you sir for this fasting and prayer!